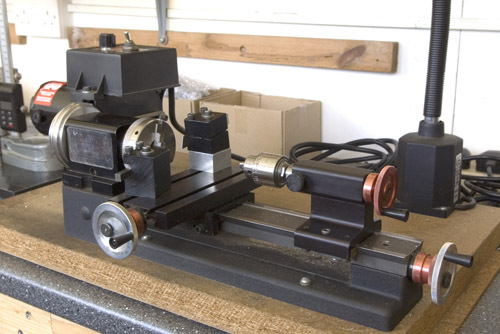 When I got serious about building model locomotives in O Gauge, I started looking around for a suitable lathe. This was the mid 90s, when the internet was still quite new and many machine tool manufactures and dealers did not yet have a presence. Sherline's web site quickly popped up and instantly impressed me, not just for the tools but for the depth and breadth of coverage. Every part was listed with full instructions for everything, descriptions of the company and the people, and links to suppliers, users, and just about any other site that might interest a Sherline user. The site is still there today, even bigger. Sherline is located in southern California. At that time my professional work took me to the USA quite frequently, so when a trip to San Diego came along, I arranged some free time in my schedule and drove up to see them. I met Joe Martin, the founder and CEO, who gave me a tour and showed me how everything was made on-site using the latest CNC machine tools. The lathe is small enough that no castings are used. The bed is a steel extrusion with the ways ground on it, and most other parts are machined in steel or aluminium. The aluminium is anodised to give it a harder and more durable finish. It was clear to me that a lot of thought had gone into the design of the lathe, right down to details like tapered gibs that are very easy to set, and zero-adjustable handwheels with a positive locking feature. I was also pleased to learn that in spite of the US heritage, you can also get them with metric feed screws and handwheels. I was sold, to the extent that I brought a lathe back with me in my luggage. In those pre 9/11 days the airlines were much more relaxed about what passengers took with them. I would not try it today, but I have brought a number of small accessories and tools back with me on subsequent visits. At least it saves the shipping costs. I soon got busy. The lathe is powered by a DC motor with an electronic speed control, routine now but still quite novel then. The low speed torque proved to be enough to turn cast iron driving wheels, and first post-Sherline loco was the LSWR T6. Others soon followed. After 20-odd years, the lathe is beginning to show common signs of wear. Even with care, the cross slide, being aluminium, did get marked over time in spite of the anodising process. I recently replaced the cross slide, and at the same time, I updated the tailstock to the improved design that was introduced since I bought it. Every single part is available separately, so I'll just carry on updating it until one or the other of us is completely worn out.